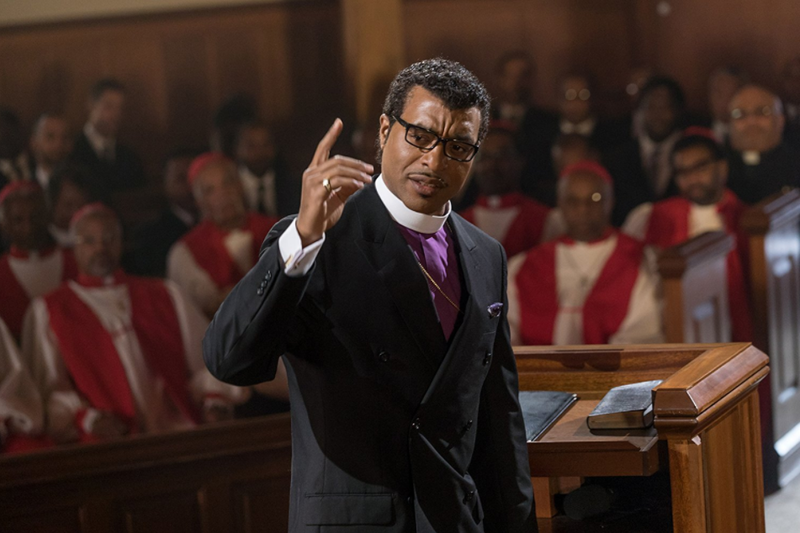 Story: Every Sunday, Bishop Carlton Pearson—evangelical megastar, brilliant orator, and television host with millions of followers—preaches the fundamentalist gospel to six thousand supplicants at his Higher Dimensions Church. He’s the pride and joy of his spiritual father, Oral Roberts, and the toast of Tulsa. One day, rattled by an uncle’s suicide and distraught by reports of the Rwandan Genocide, Pearson receives an epiphany. Suddenly it’s crystal clear—God loves all humankind; everyone is already saved, whether Christian or not; and there is no hell. But these ideas are heretical, violating sacrosanct doctrines. The next Sunday, when Pearson unveils this theology of inclusion to his flock, shock waves sweep the enormous hall. Church leaders and members begin to defect in droves, and his empire topples. Based on the true story of a controversial and courageous man of God, Come Sunday elegantly and respectfully captures the authentic texture and tone of Pearson’s devout world, never resorting to hyperbole. Source: Sundance.org. Cast: Toni Braxton (Antoinette Tuff), Trevor Morgan (Michael Hill), Yaya DaCosta (Kendra), David Manzanares (Benito ‘Benny’ Medina), Jesse C. Boyd (Jim Sterling), Mell Bowser (Curtis Madison), Malik Yoba (Lt. Franklin), Kelvin Han Yee (Harlon Moline). Story: Seven time Grammy Award winner Toni Braxton stars as Antoinette Tuff, a struggling single mom from Georgia who heroically averted a tragedy, saving hundreds of lives when she convinced a deranged gunman who stormed an elementary school to surrender. On August 20, 2013, shortly after arriving to work at the Ronald E. McNair Discovery Learning Academy in Decatur, Georgia, Antoinette the school’s bookkeeper, was in the front office when Michael Hill (Trevor Morgan), a young man with a history of mental illness, snuck in, armed with an AK-47 and hundreds of rounds of ammunition. As the school went into lockdown, Antoinette was left alone with Michael, who repeatedly threatened to kill everyone. Showing enormous courage and empathy, along with nerves of steel, Antoinette convinced Michael to surrender by using her own life struggles to connect with him. Antoinette’s faith in God guided her through the toughest moments of her life, ultimately preparing her for that fateful day. Source: Lifetime. Director(s): Aaron Greer, Seth Panitch. Studio(s): Gettin’ Grown Productions, University of Alabama. Story: In 1967, both Eli Rosenberg and Michael Dubois have a problem. For Eli, only one medical school in the country will accept him: Meharry Medical College, an all-black medical school in Tennessee, a considerable distance from his life in Brooklyn, New York. For Michael, only one medical school in the country will do for him: Meharry Medical College, his successful father’s alma mater, and therefore his, whether he likes it or not. Inspired by a true story. 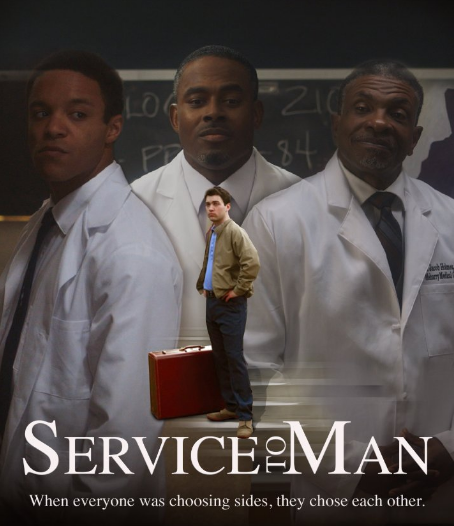 Source(s): servicetoman.com, official site; IMDB. Details: the incredible untold story of Katherine Johnson (Taraji P. Henson), Dorothy Vaughn (Octavia Spencer) and Mary Jackson (Janelle Monáe) — brilliant African-American women working at NASA, who served as the brains behind one of the greatest operations in history: the launch of astronaut John Glenn into orbit, a stunning achievement that restored the nation’s confidence, turned around the Space Race, and galvanized the world. The visionary trio crossed all gender and race lines to inspire generations to dream big. Source: 20th Century Fox, official site. Update 8/15/16: Today People reported that the film tells the true story of Katherine Johnson, the African-American physicist and mathematician who calculated the trajectory for Project Mercury and later Apollo 11’s 1969 flight to the moon. In the trailer, Johnson, along with her colleagues Dorothy Vaughan and Mary Jackson, work to discover the calculations that helped the first American astronaut make a complete orbit around the Earth. Henson takes on the role of Johnson while Octavia Spencer and Monáe star as Vaughan and Jackson, respectively. 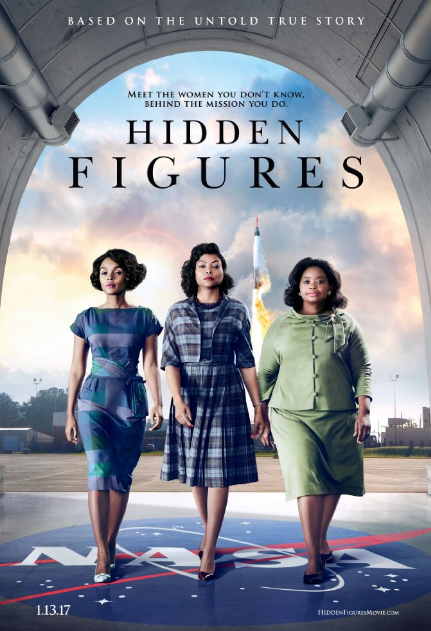 The clip gives the first look at Henson, Spencer and Monáe as the three legendary women who overcame adversity and discrimination to ultimately change the course of history and win the Space Race for NASA. Source: People.com. Update: 3/7/16: The Wrap reports that pop star Janelle Monae has landed the third lead alongside Taraji P. Henson and Octavia Spencer in the Fox 2000 drama Hidden Figures. The story follows three African-American women who served as the brains behind NASA’s Friendship 7 mission, which saw astronaut John Glenn become the first American to orbit the Earth in February 1962. Henson will play Katherine Johnson, Spencer will play Dorothy Vaughan and Monae will play the youngest member of the trio, Mary Jackson. Kevin Costner will co-star as the head of the space program. Source: The Wrap. Story: The project follows Katherine Johnson, a brilliant African-American mathematician who, along with her colleagues Dorothy Vaughn and Mary Jackson, served as the brains behind one of the greatest operations in U.S. history — the momentous launch of astronaut John Glenn into orbit, and his safe return. The script is based on Margot Lee Shetterly’s upcoming book Hidden Figures: The African American Women Mathematicians Who Helped Nasa and the United States Win the Space Race. Source: Flickering Myth. Photo Sources: More; Wikipedia. Marton Csokas (Sheriff Brooks), Michael Shannon (Grey Villet), Nick Kroll (Bernie Cohen), Jon Bass (Phil Hirschkop), Bill Camp (Frank Beazley). 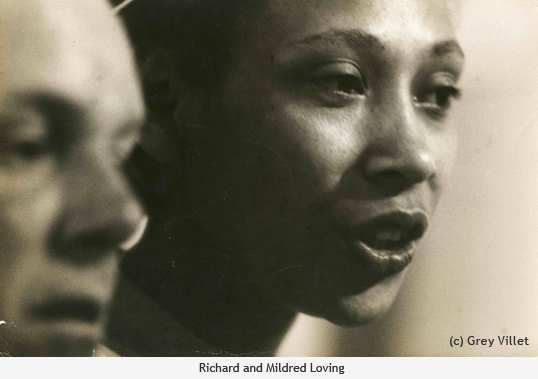 Story: On 5/8/15 Deadline reported that Joel Edgerton and Ruth Negga will star as Mildred and Richard Loving, the couple behind the seminal 1967 civil rights case Loving vs. Virginia. Big Beach will finance the film, which is inspired by the documentary The Loving Story. Richard and Mildred Loving, an interracial couple, were married in June 1958. As a result, authorities broke into their home, arrested them, and they were sentenced to a year in the state penitentiary. This sentence was suspended on the condition that they be exiled from the state of Virginia. Unbowed, the couple spent the next nine years fighting to get home, together, and the theme of the story is about marrying the one you want and finding the one you need. 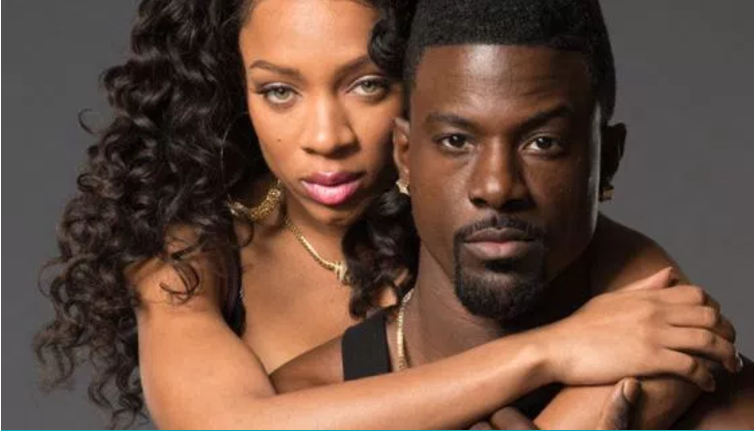 Shadow and Act stated on 11/20/15 that principal photography was underway in Virginia and that the story of the Lovings became the basis of Mr. & Mrs. Loving, a 1996 made-for-TV movie that starred Lela Rochon, Timothy Hutton and Ruby Dee. However, it was reported that Mildred Loving dismissed it as mostly fantasy. Sources: Deadline; Shadow and Act; Photo Sources: lovingfilm.com; Shadow and Act. Studio(s): BN Films, 1019 Entertainment, Brightside Entertainment, Itaca Films, Yoruba Saxon Productions, Distributors Paramount Pictures. Cast: David Oyelowo (Brian Nichols), Kate Mara (Ashley Smith), Michael Kenneth Williams (Detective John Chestnut), Mimi Rogers (Kim Rogers), Leonor Varela (Detective Sanchez), E. Roger Mitchell (Sergeant Teasley). Story: Based on a miraculous true story that drew the attention of the entire nation, a thrilling drama about the spiritual collision of two broken lives. When Brian Nichols – on the run as the subject of a city wide manhunt and desperate to make contact with his newborn son – takes recovering meth addict Ashley Smith hostage in her own apartment, she turns for guidance to Rick Warren’s best-selling inspirational book, The Purpose Driven Life. While reading aloud, Ashley and her would-be killer each face crossroads where despair and death intersect hope. 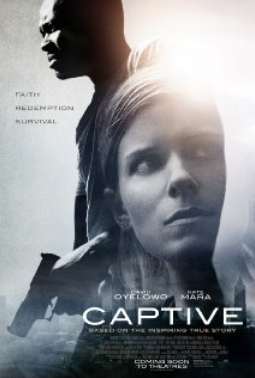 Source(s): captivethemovie.com, IMDB.